Posted on March 9, 2017 April 24, 2019 , in Swim Spas. Both pools and swim spas offer places to exercise, relax, and have fun while basking in the sun, but with so many different features available, it can be hard to know which to choose. Knowing the differences is the first step in moving toward the right investment. Below, you’ll learn eight strategies that will ensure you make the right choice. Both swimming pools and swim spas are great places to improve your fitness level. For lighter workouts or gentle paddling, a swimming pool has everything you need. But when you want a more intense workout, a swim spa has several advantages. Because you can’t rest on the walls at each end, you’ll spend your entire workout swimming. A quality swim spa will also feature an adjustable current so you can create more difficult workouts to improve your fitness level even more. One of the biggest differences between a swim spa and swimming pool is how often you’ll be able to use them. A swim spa can be used for relaxation or exercise every day of the year, while a swimming pool season usually lasts between three and four months. If keeping your workout schedule consistent is important to you, or if you know you enjoy being in the water every day, a swim spa or an indoor pool is the best choice. Swimming pools, with their diving boards and deep ends that are perfect for cannonballs are fantastic places for kids to play. But if you want more from your investment, the versatility of a swim spa can be a plus. Not only is it a great place for kids to have fun, but it can also serve as a hot tub, wave pool, and gym. By adding accessories, you can expand these options even more. Due to differences in insulation between swim spas and swimming pools, swim spas tend to use less energy and cost you less to use. Swim spas feature insulation that holds heat in and regenerates it, making them more economical to heat year-round than a pool. If you’re on a tight budget, you’ll definitely want to know about the price differences between swimming pools and swim spas. Swimming pools cost between $45,000 and $100,000, so if you have a large budget a swimming pool is feasible. If you have a lower budget, a swim spa can bring you the fun and fitness options of a swimming pool with a much lower price tag of $22,000 to $50,000. You should also keep in mind the cost of extra accessories and requirements like covers. Swimming pool covers are priced between $3000 and $5000. Swim spa covers will cost you between $1200 and $2000. 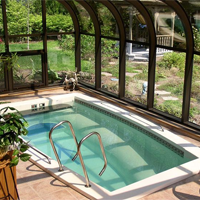 If you need fast installation, a swim spa has distinct benefits over a swimming pool. Swimming pool installation is more complicated and takes longer than swim spa installation. Before installing a swimming pool, you may also have to get permits and approval from neighborhood associations which can be time-consuming. The installation process for a swimming pool is usually two to four weeks while swim spas take just a few days to install. Swimming pools are costly to heat because they lose substantial heat through the surface of the water. The best swim spas cost a lot less to run because they have the capability to reuse residual heat from the motor. In addition, they utilize insulated hard covers to absorb any waste heat from the water. This will make it unnecessary to heat the swim spa in summer. If you enjoy a challenge and want to take on maintenance on your own, a swimming pool is a fine option. Just keep in mind that you’ll have to skim and vacuum on your own. It’s also important to invest in a robotic cleaner, but these can be pricy. If you’d prefer less maintenance so you have more time to spend with your friends and family, look into a self-cleaning swim spa that can do the work of cleaning, skimming, vacuuming, and filtering for you. Now that you know more about the very different features of swim spas and swimming pools, download our buyer’s guide to discover which swim spa is the best choice for you.